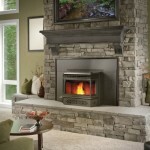 Did you know that as much as 80-90% of the heat produced by a typical wood burning fireplace is lost up the chimney? Not only does an open fireplace over-consume expensive firewood, it also robs 30% or more of the heat produced by the home heating system when the damper is open. There are several ways to limit home heating losses through the chimney–such as adding a fireplace door, replacing an old metal damper or installing a top sealing damper. 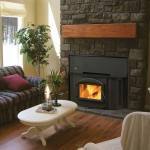 But the best choice for the greatest heating efficiency and aesthetic value is having a new fireplace insert installed. A professionally installed, quality fireplace insert will improve the efficiency of a fireplace by over 65% in most situations because it eliminates room air loss and it radiates heat from the fire back into the room. Here at Creative Masonry & Chimney, we offer several top brands of wood and pellet inserts along with professional installation, cleaning, and repair of previously installed inserts, chimney sweeps, and chimney repairs/rebuilds.